How to use the JR Pass? 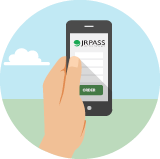 Watch the video below and learn how the JR Pass works. Whether you are a new or frequent traveller in Japan, here are some of the most essential apps to help you make the most of your Japan Rail Pass. Losing things on the train is never fun. Luckily Japan is one of the safest countries in the world, and JR has many lost and found offices to try. Your Japan Rail Pass not only covers travel on the Bullet Train, but on JR buses too. 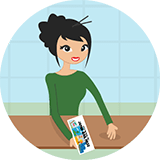 Find out how to use the bus system with or without a pass here. Usually you'll find plenty of empty seats on the Bullet Train, but if you're looking into reserving seats here's what you need to know. The amazing station bento, or 'ekiben', is the stuff of travellers dreams, don't you dare ride a train without buying one! For many, seeing the snow-capped peak of Japan's no.1 volcano, Mt. Fuji, will be at the top of your list of things to do. Discover how to use the Hyperdia online timetable to calculate train timetables and understand if a Japan Rail Pass is the best choice for you. JR Pass on the Narita Express? Landing at Narita you can activate your Japan Rail Pass and hop on the N'EX to Tokyo immediately and for free! Click here for more info. 14 sample itnerary: Tokyo, Kyoto, Hiroshima, Kyushu and Osaka. Example itinerary for the 14 day JR Pass. From Tokyo going all the way down to Kyushu, visiting Kyoto, Hiroshima, Kyushu, Himeji and Osaka. Find out what the difference is between Standard and Green Car travel, during peak season you may wish to invest to ensure travelling in comfort. Kyoto station is the gateway to Kyoto and the rest of the Kansai area. Activating your JR Pass here can be confusing so here is a handy guide. From 12th March 2011, the Japan Rail Pass is valid on the new Sakura Shinkansen, whisking you from Osaka-Kagoshima in just over 4 hours! From March 2011, the Japan Rail Pass can be used on the new JR East Hayabusa service which takes you from Tokyo to Shin-Aomori in just over 3 hours! We've contacted Japan Rail and found out useful information that'll come in handy if you're planning on travelling around Japan with young children. In addition to the JR network, Japan has lots of smaller privately owned lines where you will need to purchase tickets, find out how here. Why do I purchase an Exchange Order and not a 'Japan Rail Pass', and how long do I have to validate it? Do you pass the eligibility test? Who is eligible for a Japan Rail Pass? Are you a tourist, entertainer, student or apprentice? We have all the info you need right here. Read this if you don't want to feel a wave of panic every time you read your Japan Rail Pass expiry date! We tried Pocket Wifi in Japan, here's what you need to know about getting your own. Nagoya is one of the busiest stations in Japan, let us be your guide to activating the JR Pass. Here is how to activate the JRPass in Osaka. The Shinkansen station for Osaka! Here's how to activate the JR Pass at Narita Airport. Visit Tokyo, Kyoto and Nara with the 7 day JR Pass. Highlights of Japanese culture and tradition visited with the JR Pass. Resort Shirakami train and Japan Rail Pass. Find our recommended mobile Apps right here! Are you confused about which lines your Japan Rail Pass covers? 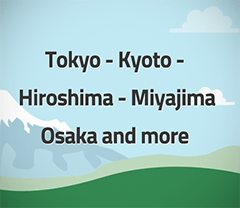 Here are simple rules to check your destinations are covered by Japan rail pass! Explore north of Tokyo using the JR Pass. Visiting Tohoku and Hokkaido. Sneak peak with Google Street View. Night Trains using the JR Pass: the Sunrise express and Hamanasu trains. Learn about night trains using the Japan Rail Pass. We have selected the best places in Shikoku to visit with the Japan Rail Pass. Family trip with the Japan Rail Pass: Tokyo, Kyoto and Osaka. Family trip to Tokyo, Kyoto and Osaka. That is fun for everyone. Combine an Onsen visit with a traditional Ryokan stay at Kinosaki Onsen. Visiting the 2016 FIFA Club World Cup with the JR Pass. 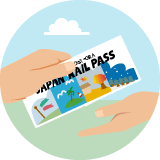 Learn how to access the stadiums for the FIFA Club World Cup with the Japan Rail Pass. 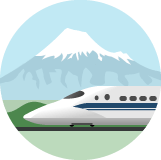 Learn all about the Hokkaido Shinkansen and the Japan Rail Pass validity. Explore over 140 years of railway history from steam trains to the latest technology regarding high speed Maglev trains. Unlimited internet access and high speed data with our Pocket WiFi in Japan. Let us help you find the best Japan Rail Pass for your trip to Japan. 5 Do’s and Don’t using the Japan Rail Pass. Visiting Japan for the first time? The rail system can seem doubting at first. Here are 5 mistakes you can avoid by simply reading the article. Here's what you need to know about visiting the Rugby World Cup 2019 in Japan. Our top recommendation of what to do in Onomichi. How to get there, what to eat, buy and see! Ride the Hello Kitty Shinkansen with your Japan Rail Pass. Find all details in the post, timetable and tips included. Find true Zen among the hidden temple town located at the top of Mount Koya. Find out what to do at Koya-san and how to get there with the JR Pass. Are you as much an Anime fan as us? We explore the best spots for manga, anime and cosplay culture all around Japan. Ride the Haruka Express with the Japan Rail Pass for Free. The best way to get from Kansai Airport to Kyoto, Osaka and back. Getting from Narita Airport into Tokyo, with and without the Japan Rail Pass. How to travel between Narita Airport (NRT) and anywhere in Tokyo. Traveling around Japan during Christmas and or New Year? Japan is amazing during the holiday period but it can be really busy! Here’s what to expect. Japan is known to be expensive - nothing is further from the truth with a bit of good planning. Here are our tips to travel Japan on a budget. Come follow up on Instagram for the best tips and places to visit around Japan, or share your Japan travel pictures with us. With Huber, you can meet local Guides from all across Japan. It is the best way to connect with locals and experience Japan as it is meant to be. 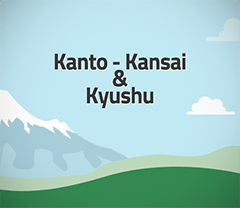 Explore the Kansai region with a JR Kansai Area Pass. Visit: Kyoto, Osaka, Kobe, Nara, Himeji and more. We're offering FREE shipping this Black Friday to many countries. See how you qualify right here. Japan is known as a pricey destination. Let us show you how to save money on your Japan visit with 10 amazing things to do for free in Japan. Winter in Japan is something special, all across the country, there are illuminations and light-ups. Japan offers a wide range of hiking options, here's our guide exploring the hiking options that Japan has to offer. Our favorite events to visit in Japan during 2019! Which lines does NOT the JRPASS cover? The JRPASS covers only Japan railway (JR) transports. Non JR lines such as subways, Tokyo metro and other company lines. The Hello Kitty Haruka Express will ferry visitors to Japan between Kyoto, Osaka and Kansai Airport (KIX). It will be very unfortunate if you are unable to use your Japan Rail Pass as you have forgotten it at home or can’t locate your JRPass in Japan. Our top 12 things to pack when traveling around Japan. Packing for your first trip to Japan can feel like an overwhelming task, maybe even a bit scary. We're here to help with our top 12 things to pack. Try other keywords or visit our Blog or Forum.